Tracks we've been on and what we thought. All these tracks should be considered as 4WD only, although some may be possible in a sturdy high clearance 2WD. Check carefully first. Limited fuel and water supplies on all these tracks and some require permits. Sandover Highway Mount Isa to Alice Springs Easy, deep to moderate sand and gravel on the NT section. No facilities but quite scenic. Tricky to find the start at the QLD end. 800 kms. Bloomfield Track. Cooktown to Cape Tribulation Difficult, steep winding and slippery gravel. Drainage channels along the sides so there's not much room for error. Despite the track being along the coast, there almost no views of the sea due to the dense vegetation. Cairns to the Tip Fairly easy (some corrugations) using bypass tracks NOT the OTT, long, hot and dusty (need lights on). $88 ferry return fare (trailers extra) at Jardine River crossing. Plenty of side trips (Weipa, Mapoon, Pennefather River (deep sand! ), Capt Billy Landing, Chilli Beach, Portland Roads, Lochhart River). Very windy on east coast, calm on the west. Regular road houses. Bamaga, Seisia, Somerset at the tip. Take a trip to Thursday Island. Lakefield National Park and Cooktown on return. 800 kms plus side trips. Googs Track. Ceduna to Tarcoola. Great fun and not too difficult. Deep sand and plenty of sand dunes. Camping at Googs Lakes and Mount Finke. 200 kms. Permit needed. South to North direction recommended. Use CB and sand flags on crests. CSR We've done 2/3rds of the CSR in 2 stages, comprising the top section from Bililuna to Well 33 near Kunawaritji (700 kms), and the centre section from Well 33 to Georgia Bore near Well 22 (300 kms). The CSR is long and lonely but a great desert experience and well worth all the the effort and planning. It covers hundred of sand dunes, some of which are a bit difficult. However, once you start, there is almost no chance of vehicle recovery except under it's own steam, so total self sufficiency is a prerequisite. No permit required unless you deviate off the track but access tracks will require permits. Gary Highway Very corrugated but quite easy. No facilities. (400 kms from Kunawaritji to Everard Junction, plus another 400 kms to Warburton). Veevers Crater and McPhersons Pillar are worth investigation. See my Wiki entry at http://en.wikipedia.org/wiki/Gary_Highway. Eagle Highway Very variable, narrow and very overgrown in places, the track is almost indicernable and poses a navigation hazard, May large washaway's needing diversions. No facilities. (800 kms from Great Central Road to Kunawaritji via the Talawana Track and CSR). Talawana Track Very corrugated but quite easy. No facilities except good water at Midway Well. (200 kms from Eagle Highway Junction to the CSR near Well 24). Kidson Track This track used to be a very challenging 4wd track from Kunawaritji (Well 33 on the CSR) to 80 Mile beach. During 2012, much of the western end of the track was graded to allow access for mining vehicles and has become a wide smooth gravel road. The eastern 200km still has demanding sand dunes and overgrown section. 650kms, no facilities. Balladonia to Condingup (Cape Arid) This is a useful shortcut (in distance, not time) between Balladonia and Cape Arid (Condingup township, store/fuel). 200 km, wide track but rough in the Balladonia section, better at the southern end. Would be difficult in the wet. Sign at northern end restricts vehicles to 4WD and 3Tonnes. No signs at the southern end and unnecessary anyway. Be aware that the Mt Ragged alternative route to Cape Arid (turns off half way along) may be narrow and impassable after rain and Esperance is a very wet area. Shark Bay to the most westerly point of the Australian mainland This track starts as a fairly smooth gravel road (120km) on the Useless Loop road from Hamlyn Pool on Shark Bay via Tamala Station. (Note the gravel used is salt residue from the salt works and will become quite corrosive when wet. Wash down the underside of your vehicle if returning after rain). It then deteriorates as you approach the Steep Point National Park where it becomes a difficult, narrow sandy track (40km) across several challenging sand dunes to the Ranger Station. Track due south from Madura This track south starts just east of Madura as a fairly smooth 10km gravel road to Madura Cave which is worth a visit. Thereafter, it deteriorates into a narrow sandy and overgrown track for a further 40km towards the coast. Although narrow, it is navigable with care over soft sand dunes dodging the low slung vegetation. This track does not actually reach the coast, the bush become impenetrable and it terminates at a track junction a km from the beach, but is is quiet and very scenic with plenty of birdlife. There are a few secluded camping areas along the track and at the junction. The beach could be reached on foot (which we didn't do, it felt scarily remote), as there are signs of earlier now overgrown tracks further south. Tanami Track. Halls Creek to Alice Springs Long gravel track (1100 kms) but not too difficult. Reasonable facilities along the way. Rabbit Flat Roadhouse is no longer operating and this can catch people out if you need fuel half way along but Yuendumu and Tilmouth Well road houses are open. No facilities at the Granite Goldmine. Anne Beadell Highway. Coober Pedy to Laverton Very long (1500 kms), fairly straight but very corrugated. No water on SA side, fuel and 3 water tanks on WA side. Good desert scenery plus a section of sandhills. Items of interest: Atomic bomb sites, Emu Field and Dingo Claypan. Aircraft wreck. Several permits needed. Gary Junction Road. Alice Springs to Newman Long straight and easy track which passes some historic outback locations: Sandy Blight Junction, Talawana, Gary Highway Junction, CSR, Rudall River National Park. Good camping at Jupiter Well. 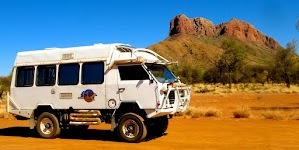 (1500 kms Alice to Newman). Permits needed. Sandy Blight Junction Road Winding and tortuous but interesting (400 kms and longer than expected). Deep corrugated sand alternating with rocky gravel. Interesting scenery on the southern section. Permit needed. Great Central Road Easy going but not very inspiring. The road now bypasses all the native wells along the way, which is disappointing. Giles Met Office is well worth a visit. (1000 kms from Laverton to Yulara, +/- a couple). Permit required. Mareenie Loop road Very scenic road from Kings Canyon to Hermansberg, but very corrugated in parts. (200 kms). Permit needed. Gibb River Road A bit rough in places but this is more than made up for by the many scenic gorges, water falls and rivers along the way. (650 kms excluding Mitchell Falls, which is another 600 kms round trip from the Gibb River Road junction, see below). Mitchell Falls Road Very corrugated track but leads to the beautiful Mitchell falls so it's worth the suffering. Good camping at Drysdale Station, King Edward River and at the falls. Extra trek to Surveyors pool is worthwhile on a newly made but re-aligned track, which now starts further north than marked on maps. Access to Port Warender (no facilities) is also possible but the track is VERY steep and tortuous towards the end. (600 kms return from Gibb River Road junction including Surveyors Pool).